Klan costume for "Great Titan"
Several years ago while living in Atlanta, I went behind the scenes at the Martin Luther King Jr. Center. The National Historic Site includes the Ebenezer Baptist Church and King’s boyhood home. Among various artifacts in the archive: a robe and hood that once belonged to a member of the KKK. Just glancing at the garments felt chilling. But the real shock came when I noticed that there were labels attached them. 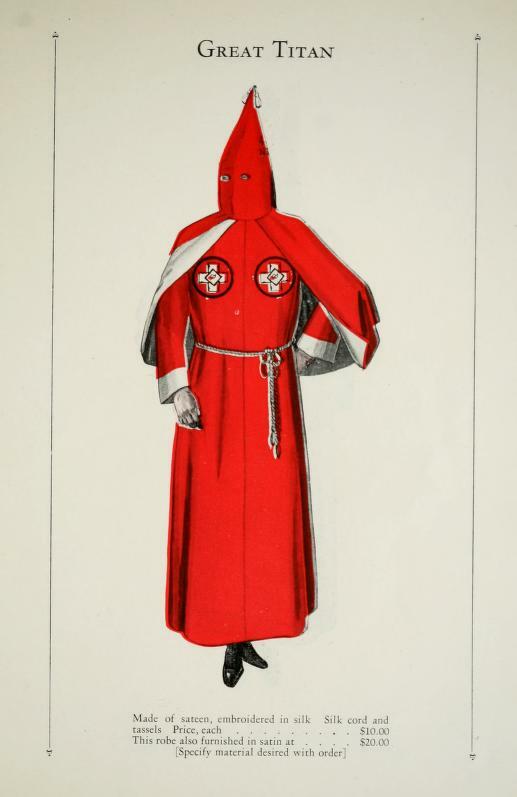 During the nineteenth century, the robes and hoods worn by Klansmen were sewn at home by loving wives and mothers. But by 1915 when the Klan resurgence started, they would have been manufactured in a factory. And the people who assembled them surely included black workers. Around the same time, many Confederate statues were constructed in Northern factories, ironically, because industry below the Mason-Dixon Line remained decimated. These statues, like the Klan robes, would have embodied the labor of black men. On one hand, a job is just a job. On the other hand, a job may demand the creation of objects that sear one’s body and soul. Historians have identified several reasons for the Klan’s second coming after World War I. They include the influx of European immigrants, which began even before the Civil War and accelerated during the 1890s; it would be stemmed by the 1924 Immigration Act. Prohibition and its enforcement – which the Klan favored – further united members. 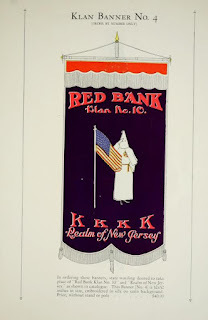 And the fact that black soldiers who fought overseas now demanded respect and equality back home also enraged whites who joined the Klan in droves. By 1920, the organization reached well beyond the South. At this time, the garments worn by its members became standardized. Various colors and insignias reflected a complex hierarchy. But the point of the costume remained clear. In the words of a Klan enthusiast: the wearer is an object of terror to all beholders. The organization does not “sell’ robes to members; it merely rents them. The price charged a member for a robe is $6.50, while the Kleagle* must pay $12 as his robe has more trimming. Made in large quantities, there ought to be a profit of at least $5 per garment, although I believe a New York garment maker could show a larger profit than that. . . The present output is about 600 robes per day. 600 KLAN ROBES PER DAY!? The World articles prompted the U. S. House of Representatives to open hearings on the Ku Klux Klan in October 1921. Unsurprisingly, the hearings led nowhere. This was a year before Southern Democrats defeated an anti-lynching bill that had been proposed repeatedly by Republicans since the early 1900s. 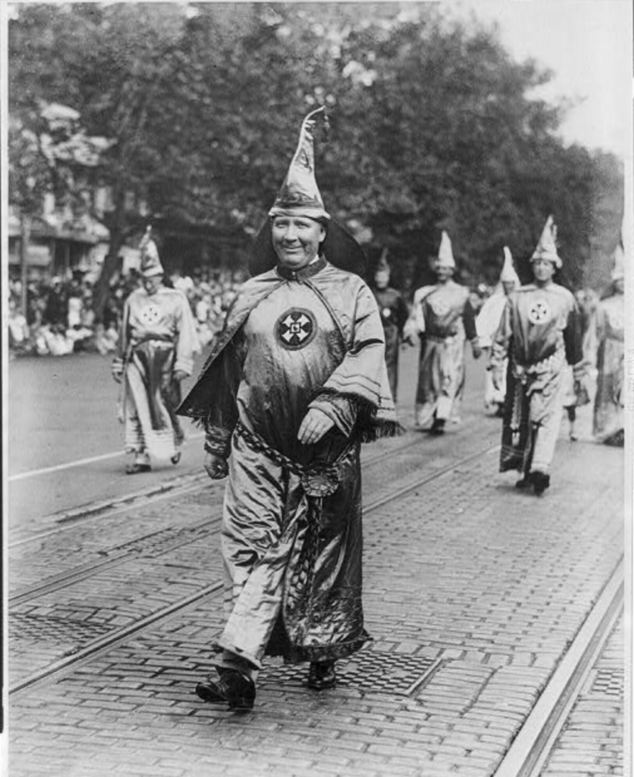 In 1925 when 30,000 Klansmen marched in Washington, D.C., the group had four million members. Waving American flags as they moved along Pennsylvania Avenue, the men cast back their hoods and boldly exposed their faces. And that’s just about where we are right now. *Kleagles are Klan officers who focus on recruitment of new members. **There is an excellent book about this aspect of the KKK: Women of the Klan by Kathleen Blee (1991). "deft insinuation into the culture of small communities" - perfect. Yes, this would make an excellent op-ed. The AJC? I know they were doing a series on race that is ongoing.